Create preliminary exploratory data visualisations of an entire dataset to identify problems or unexpected features using 'ggplot2'. #   Dimensions of df1 and df2 are not the same. vis_compare requires dataframes of identical dimensions. Update vis_cor() to use perceptually uniform colours from scico package, using scico::scico(3, palette = "vik"). visdat 0.5.2 (2018/12/06) "Youth, The Midnight, Kids"
Jim Hester fixed recent changes in readr 1.2.0 in PR #103, which changes the default behavior of the guess_parser, to not guess integer types by default. To opt-into the current behavior you need to pass guess_integer = TRUE. visdat 0.5.1 (2018/07/02) "The Northern Lights Moonwalker"
Added draft vis_expect to make it easy to look at certain appearances of numbers in your data. updated options for vis_cor to use argument na_action not use_op. Added Sean Hughes and Mara Averick to the DESCRIPTION with ctb. Fix bug reported in #75 where vis_dat(diamonds) errored seq_len(nrow(x)) inside internal function vis_gather_, used to calculate the row numbers. 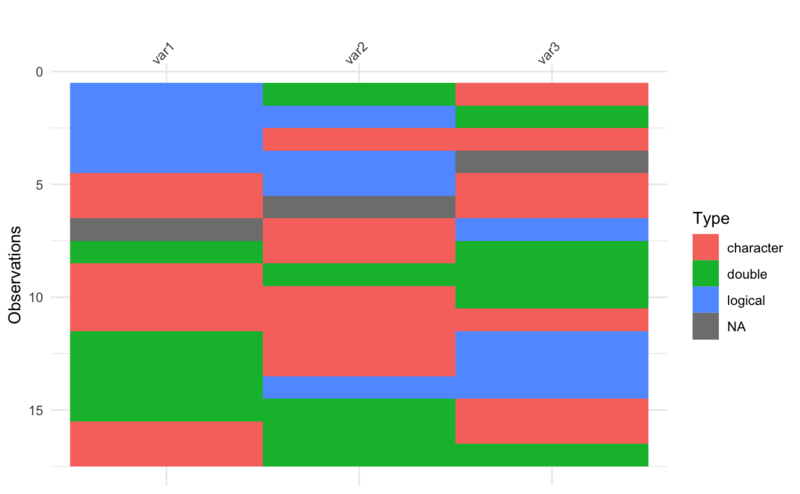 Using mutate(rows = dplyr::row_number()) solved the issue. Fix bug reported in #72 where vis_miss errored when one column was given to it. This was an issue with using limits inside scale_x_discrete - which is used to order the columns of the data. It is not necessary to order one column of data, so I created an if-else to avoid this step and return the plot early. improved hover print method for plotly. added internal functions to improve extensibility and debugging - vis_create_, vis_gather_ and vis_extract_value_. Added feature flip = TRUE, to vis_dat and vis_miss. 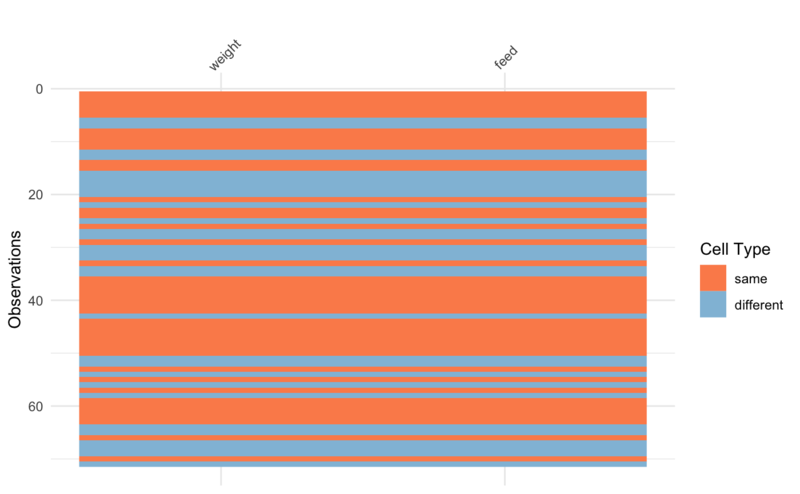 This flips the x axis and the ordering of the rows. 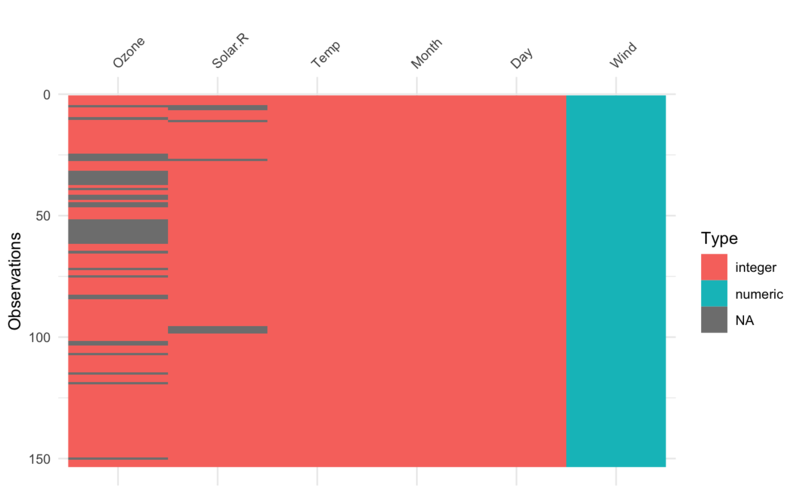 This more closely resembles a dataframe. 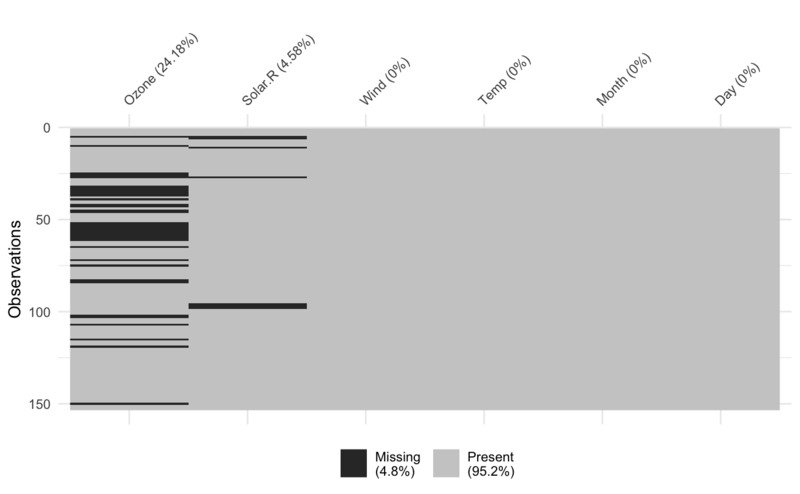 vis_miss_ly is a new function that uses plotly to plot missing data, like vis_miss, but interactive, without the need to call plotly::ggplotly on it. It's fast, but at the moment it needs a bit of love on the legend front to maintain the style and features (clustering, etc) of current vis_miss. 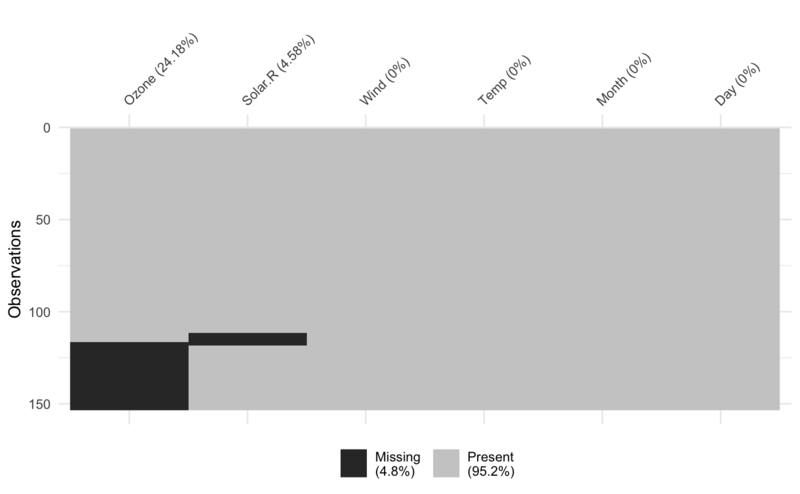 vis_miss now gains a show_perc argument, which displays the % of missing and complete data. This is switched on by default and addresses issue #19.
vis_compare is a new function that allows you to compare two dataframes of the same dimension. It gives a fairly ugly warning if they are not of the same dimension. vis_dat gains a "palette" argument in line with issue 26, drawn from http://colorbrewer2.org/, there are currently three arguments, "default", "qual", and "cb_safe". "default" provides the ggplot defaults, "qual" uses some colour blind unfriendly colours, and "cb_safe" provides some colours friendly for colour blindness. removed all instances of 1:rnow(x) and replaced with seq_along(nrow(x)). Updated documentation, improved legend and colours for vis_miss_ly. removed export for vis_dat_ly, as it currently does not work. 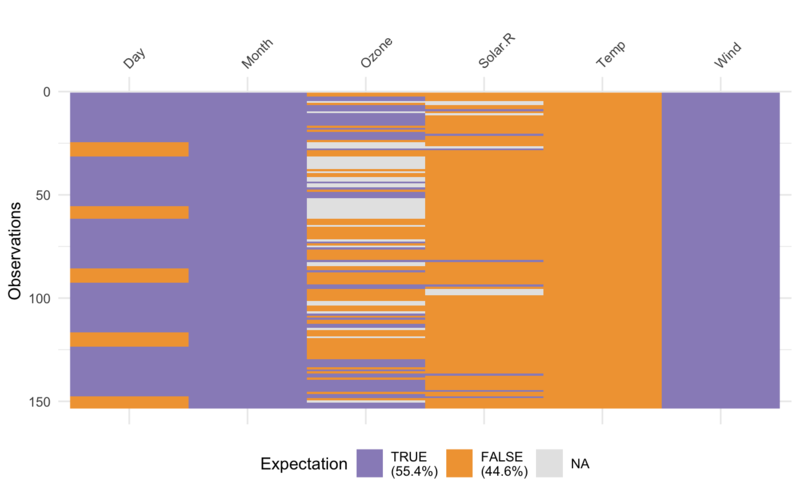 Changed the default colours of vis_compare to be different to the ggplot2 standards. vis_miss legend labels are created using the internal function miss_guide_label. 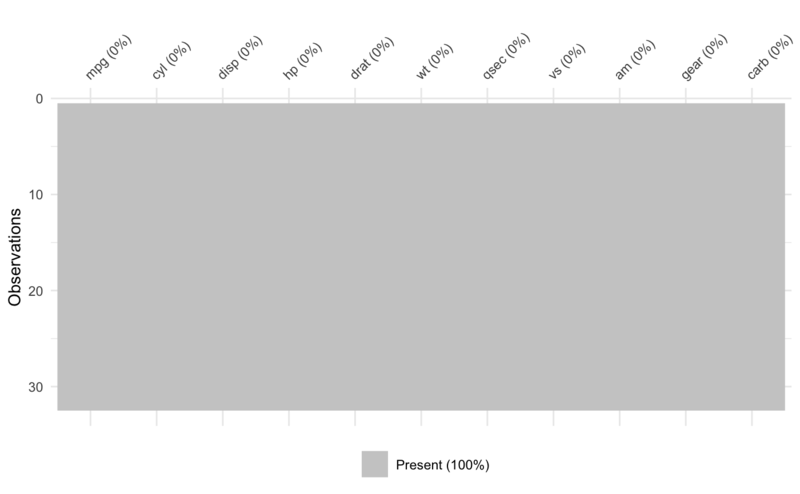 miss_guide_label will check if data is 100% missing or 100% present and display this in the figure. 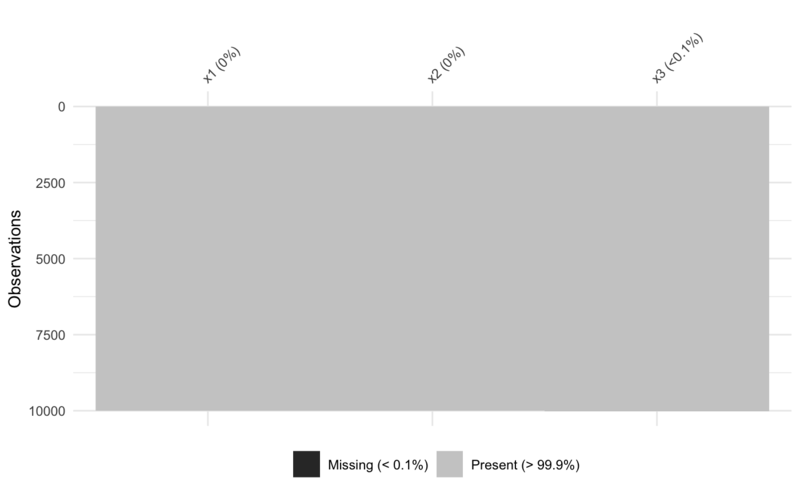 Additionally, if there is less than 0.1% missing data, "<0.1% missingness" will also be displayed. This sort of gets around issue #18 for the moment. tests have been added for the miss_guide_label legend labels function. Changed legend label for vis_miss, vis_dat, and vis_guess. Update vis_dat() to use purrr::dmap(fingerprint) instead of mutate_each_(). This solves issue #3 where vis_dat couldn't take variables with spaces in their name. 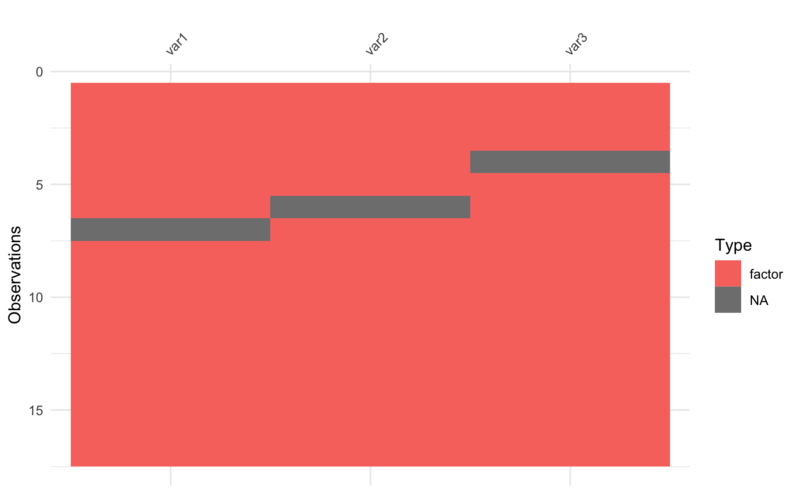 Interactivity with plotly::ggplotly! 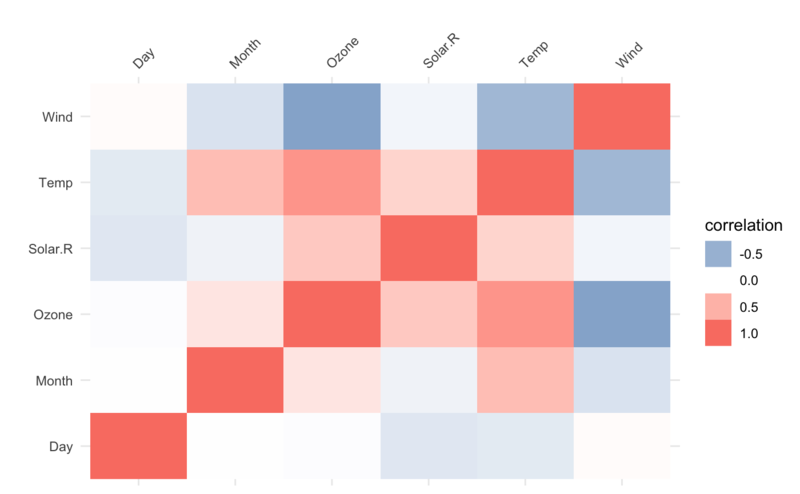 Funcions vis_guess(), vis_dat(), and vis_miss were updated so that you can make them all interactive using the latest dev version of plotly from Carson Sievert. Introducing vis_guess(), a function that uses the unexported function collectorGuess from readr.